and its finest live-aboard dive boats and dive cruises! 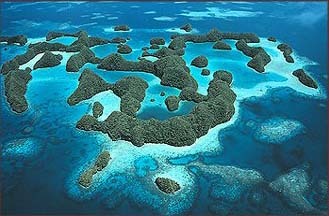 PALAU and its ISLANDS - Palau is truly a divers' paradise. 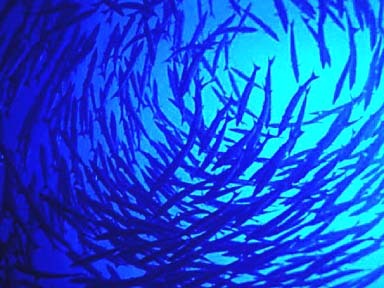 Made up of 200 mostly uninhabited islands, total human population is only about 17,000 -- yes, the fish definitely have you outnumbered! One of the official languages of Palau is English, the currency is the US dollar, electricity is the same as in the U.S. (Single phase 60 cycles, 115/230 volts AC), and even the postage is the same as in the USA. TRAVEL to PALAU - Air travel to Palau is ably handled by Continental Air Micronesia. Flying via Guam's gleaming new airport to the capital of Palau, the city of Koror, you will receive valuable Frequent Flier Mileage with Continental Airlines. Once in Palau, divers have a fine choice of live-aboard dive boats, and hotels that range in price and amenities from the modest to the majestic. DIVING in PALAU - When it comes to diving excitement, many well-traveled divers place Palau at the very top of their list. Spread over a large area, the dive sites are highly varied with a wide diversity of terrain and marine life. While many of the dive sites are in calm waters, some of Palau's best dives are known for their strong current and coincident population of large pelagic animals such as sharks and rays. If you will be doing your Palau diving from a land-based hotel, keep in mind that the daily boat rides to the dive sites may take one hour or more. But whether you choose a hotel, or a live-aboard dive boat, Palau's diving is a worthy reward for the time and money spent. 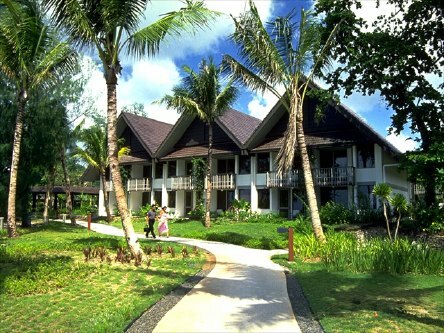 PALAU PACIFIC RESORT - Set on an island surrounded by the pristine waters of the Western Pacific, this luxury international resort combines the spirit and culture of the islands with tranquil ambience and lush natural beauty. A choice destination for scuba divers and non-divers alike, chose the Palau Pacific if you value luxury, and are not deterred by the five-star prices that accompany this fine hotel's five-star service. Hotel Package Includes: Lodging, 10% hotel tax, 7% service charge, and round-trip airport/hotel transfers. Breakfast and dinner (MAP) may be arranged at $50.60 per person per day. Breakfast, lunch and dinner (FAP) is available at $71.50 per person per day. Dive Package Inclusions: Price includes daily, two-tank boat diving provided by Fish n Fins. 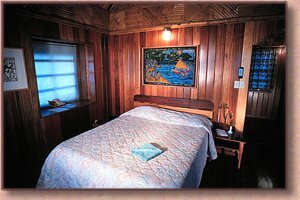 Dive trips include lunch, drinks, weights, tanks, boat trip, and land transfers between your lodging and the dive center. and airport departure tax of $20.00 per person are not included in these prices. 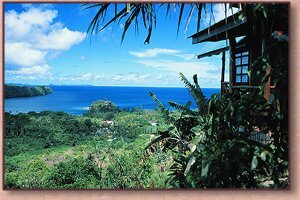 CLIFFSIDE HOTEL (formerly Sunrise Villa) - Family-owned and operated, Cliffside Hotel Palau extends to guests the true Palauan spirit of welcome. Situated on a quiet hillside overlooking Koror and its bays, Cliffside Hotel is only five minutes away from downtown Koror and all the dive shops. Just 20 minutes from the airport, they provide complementary airport shuttle service as a guest convenience. 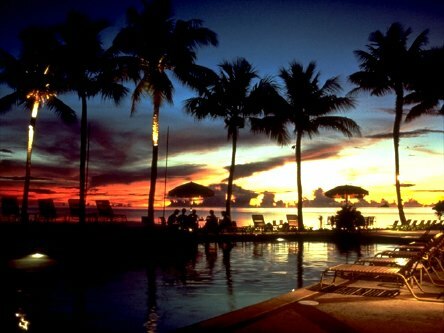 When the diving day is done, there is a comfortable cocktail lounge, a full service restaurant and a pool with poolbar & hot tub. Hotel Package Includes: Airport/hotel transfers, lodging, and hotel tax. Daily breakfast is optional at $11.00 per person per day. Breakfast and dinner daily may be prepaid at $31.80 per person per day. Dive Package Includes: All dive trips include lunch, drinks, weights, tanks, boat boat and land transfer between hotel and the dive center. Additional Expenses Include: Koror State dive permit of $15.00 per person, Peleliu dive permit of $10.00, and airport departure tax of $20.00 per person are not included in these prices. CAROLINES RESORT - Located on a lush hillside overlooking the picturesque Rock Islands, Carolines is one of the most unique resorts in Palau. Each private hand crafted bungalow is modeled after traditional Palauan architecture using local materials such as bamboo, mahogany and mangrove. Each bungalow is equipped with air conditioning, TV and VCR, refrigerator, minibar and private bathroom, and features a private balcony so you can enjoy a spectacular view each morning, and relax to the tropical sunset. Hotel Package Includes: Airport/hotel transfers, lodging, and hotel tax. Dive Package Inclusions: Price includes daily, two-tank boat diving provided by Fish n Fins. Dive trips include lunch, drinks, weights, tanks, boat trip, and land transfers between your lodging and the dive center. All prices are subject to change. 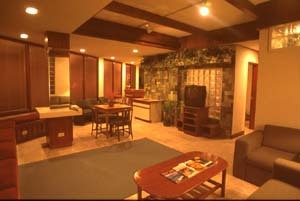 WEST PLAZA HOTELS - Some rock-bottom price options are offered by the five West Plaza Hotels. Located in Palau's modest downtown area, they include By the Sea, Coral Reef, the Downtown Hotel, Malakal, and the Desekel Hotel. While their settings may not be as romantic as Carolines, or as plush as the 5-star Palau Pacific, these downtown value lodgings are close to restaurants, shopping, and the dive shop and marina. Hotel Package Includes: Airport/hotel transfers, lodging, and hotel tax. Daily breakfast is optional at $8.25 per person per day. Breakfast option only at By the Sea and Malakal Hotels. Please note that all prices are subject to change. KNOWLEDGE - An Island Dreams' agent recently traveled to Palau, Yap, Truk, and made a cruise aboard the Big Blue Explorer. Our wholesale contract with Continental Air Micronesia will afford you discount airfares to Palau and Micronesia from around the USA. Contact your Adventure Experts at Island Dreams for confirmed bookings and complete details. READY for MORE DETAILS? - Follow this link to read Ken Knezick's new Palau Dive Report. PREFER a LIVE-ABOARD? - Follow this link to learn more about the Big Blue Explorer.